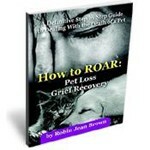 Although we have provided a great deal of information on pet loss and grief recovery you may still need further resources, and we have found one of the best books on pet loss to be by Robin Jean Brown the author of How to ROAR: Pet Loss Grief Recovery. It has seen tremendous success in softcover, and as a special offer to the Pet Memorial Urns Online network we can extend to you the downloadable ebook format courtesy of Robin Jean Brown herself, so that you can get the help you need right now, instantly. Robin Jean Brown understands firsthand the deep bond that can develop between a person and an animal. She is not a cold psychologist, but a pet owner who had to deal with the death of her own beloved pet in April 2005 after her pet experienced a long and painful ordeal with brain cancer. When searching for help for grief recovery she found that there wasn’t any that worked for her. The other books on pet loss were either too cold and clinical, or far too sad to finish reading. Another thing she discovered, was that none of them had workbook-style questions to help guide her through her journey from grief to recovery. As a result Robin wrote a guide herself, which will help you deal with grief, effectively and step by step. Robin is a personal, empathetic, and comforting person that will take you by the hand and lead you through all five stages of grief. How to ROAR: Pet Loss Grief Recovery, is not something that’s passive, where you just read about other people. Instead you will find exercises and self-help activities that will help you work through your pain. Every chapter has Journaling Questions that will validate the sorrow that you’re feeling, as Robin leads you to create your own unique story of you and your beloved pet. If you want instant help to get you through the turmoil, sadness and tears then How to ROAR: Pet Loss Grief Recovery is for you and you can begin reading it within the next minute. If you prefer to receive the softcover version of one of the best books on pet loss available, you will find it featured below along with a number of other excellent books on pet loss that may also be suited to your needs.